Picked up a 58 Lone Star Coronado today, in pretty good condition. 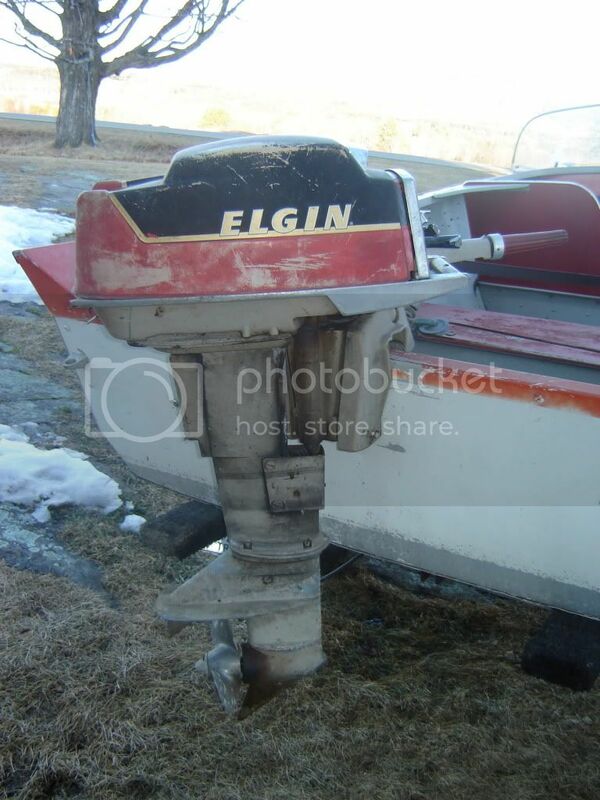 Came with a funky 12hp Elgin, that has a key switch that can change the horsepower to 5 or 7.5 or 12, depending on who you are lending your boat to. From what I've read, the Coronado is the same boat as the Malibu, but the Malibu has upholstered seats, and a second seat back on the rear seat, right? I'm going to try to redo the original paint scheme and put a 58 Lark on it. Very nice original condition, looks like it has the cutout in the dash for port steering, should also have another control mount on the port side which they did away with in later years, I think you are correct about the seating. P.S. now I know whats missing from my Malibu's dash center, is it just a flat plate? and how is "Coronado" done, is it paint or embossed? Here's a shot of that plate. There is some raised area, the star at the left and the panel to the right. I think the rest is painted or silk screened? i wondered if I might have to get a vinyl decal made up to restore this plate? You are right about the port side control mount and steering cutout. Although, I too think this is in good condition for it's age, I've been planning to repaint it because the paint is so faded. I prefer good enough original to mediocre repaint (I'm not very experienced) but this one seems to call to be refreshed. Your comment about it being in "very nice original condition" causes me to pause. Maybe I should wait a season? Thanks for the pic. thats perfect, I can see the raised areas. One thing I would suggest before you paint is to get it in the water and check for leaks, take care of any that you find. I stripped mine of all paint (it was brush painted once) and will get it in the water, I already know the transom and chine seams leak, I don't want to ruin new paint fixing leaks. I did hose test the inside of the hull to check for leaks but getting it in the water with the engine attached in my opinion is the true test. Very nice boat David good luck with the overhaul!